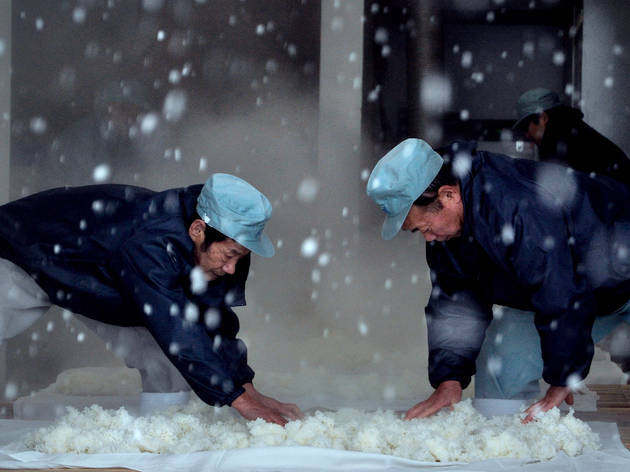 Not too far removed from Jiro Dreams of Sushi, Erik Shirai’s The Birth of Saké is a contemplative portrait of a year inside Japan’s Tedorigawa sake brewery. The atmospheric film looks at the lives of a small group of manual labourers who must brave difficult working conditions (like having to live together for six months at a time) to preserve a 2,000-year-old tradition. Shirai and producer Masako Tsumura first visited the brewery in 2012 and, after months of negotiation, were finally given access to film at the brewery. They returned in 2013 to ‘live amongst the workers at the brewery and capture the intense and relatively unknown process (even within Japan) of traditional sake making’. As a Japanese-American, I wanted to share the story of my own people and my culture. I see so many films made about Japan and Japanese culture through the eyes of foreigners and I felt that it was important that this film be made with a Japanese perspective. This film is a tribute to all Japanese artisans who dedicate themselves to their craft. Do you think the tradition is in danger of dying out? I do not believe that sake making will ever completely die out but I do believe that, in this modern age, making sake traditionally has become very difficult. I hope that this film will allow more people (both in Japan and abroad) to appreciate the craftsmanship and dedication involved. What was it like to live amongst the workers at the brewery? It was very interesting. We woke up with them every morning at 4.30am, we had breakfast, lunch and dinner with them and even got drunk with them every night. This enabled us to get very close with everyone and it allowed us to capture the very intimate lifestyle that these workers live for six to seven months every year. By the end of the filming, we became a part of their small family. Tell us about a moment that impacted you the most? There is a very specific moment in the film that impacted both my producer and I, but I do not want to give anything away for those who haven’t seen the film yet. When you see the film it will be very obvious. Did you get a sense that the sake makers are passionate about what they do, even though they have to deal with certain hardships? I think you need to have a strong passion for crafting sake or you will not last very long, especially with this very difficult lifestyle. It’s very common for many workers to quit after the first season because it is so difficult being away from their families. Many workers must sacrifice their time with their family because there is very little work in the region they live. You were funded by Kickstarter – 394 people and $50,000. Were you surprised by the support? Yes! 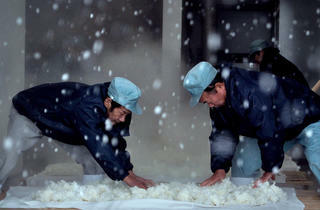 But I think people supported the film because they were genuinely interested in knowing how sake is made traditionally. We were very fortunate and will forever be grateful to everyone who helped us make this movie. The documentary premiered at Tribeca Film Festival in April. How did that go? It was a great experience, especially for our two main characters, Toji-san and Yachan, who came all the way from Japan as guests. I think they were surprised at how many people came to see the film and the positive response it received. They were nervous at first but with a little sake they loosened up and were crowd favourites at the festival. Any screenings scheduled for Tokyo? We have submitted the film to a few festivals in Japan so we hope that it will be accepted so it can be screened in the land of sake. We will keep everyone updated on all of our screenings via our Facebook page at www.facebook.com/BirthOfSake. For more info, visit www.birthofsake.com.